Our team are here to help you. Whether your child is new to horses or an experienced rider our camps are designed for everyone. Kiah Park was established in 1978 and is one of Queensland’s leading horse riding facilities, specialising in horse riding holidays for children. Our focus is on horse riding, but there is also so much more. Kiah Park is a home-away-from-home where your child can develop independence, learn new skills and make lifelong friendships with other horse-loving children. Our horse riding camps engage school-aged children in the fresh excitement of spending time outdoors. Offering 7 Day horse riding camps during all Queensland school holidays, as well as shorter camps over long weekends throughout the year, it’s an ideal place for kids who love animals. We follow an active and busy schedule providing your child with a great range of outdoor fun, including learning to care for their horse, arena lessons, trail rides, challenge team activities, camp fires with sausage and damper roasting, and a gymkhana as the climax of the week. 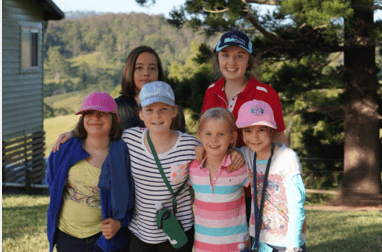 For those who just want a great day out we have Day Camps on specified days throughout the Queensland holidays, taking children on trail rides through the stunning, hilly countryside. Kids don’t need any previous horse riding experience to enjoy a wonderful time at Kiah Park as lessons are incorporated into the program for new riders and they are allocated a horse to suit their riding ability. Includes accommodation with adult supervision and great meals. Children adopt a horse to enjoy for the week and activities include arena lessons, trail rides twice a day, learning how to keep and care for a pony/horse, gymkhana, animal feeding, collecting chook eggs, cow milking and fun night activities. A compact and fun-filled weekend away. Full accommodation and nourishing meals are provided. Activities focus around horse care, lessons, riding and a fun gymkhana plus lots to keep the children busy and happy in between. school holidays and some weekends. Suitable for children 8yrs – teens, must be able to trot and have good control of a horse. Includes an arena lesson, trail rides, meals and heaps of fun. A programme can be tailored to suit your group.